You’re in the Ireland and you have just landed. Your trip begins. What do you with in Dublin with your family? Poets, writers, artists and more walked down these winding streets and now I will too in just a few short hours. Our Aer Lingus Flight touches down at the early time of 4:40 in the morning and our family realizes, we are in Ireland. It is a first trip for all of us but something tells me it would not be our last. We are about to find out what to do in Dublin with our family. Landing just outside of Dublin, I have been to many cities that are shut down at 5 in the morning. Finding a cab or a bus is impossible. Not at the Dublin airport, or Aerfort Bhaile Átha Cliath. Finding a way into the city is fine. 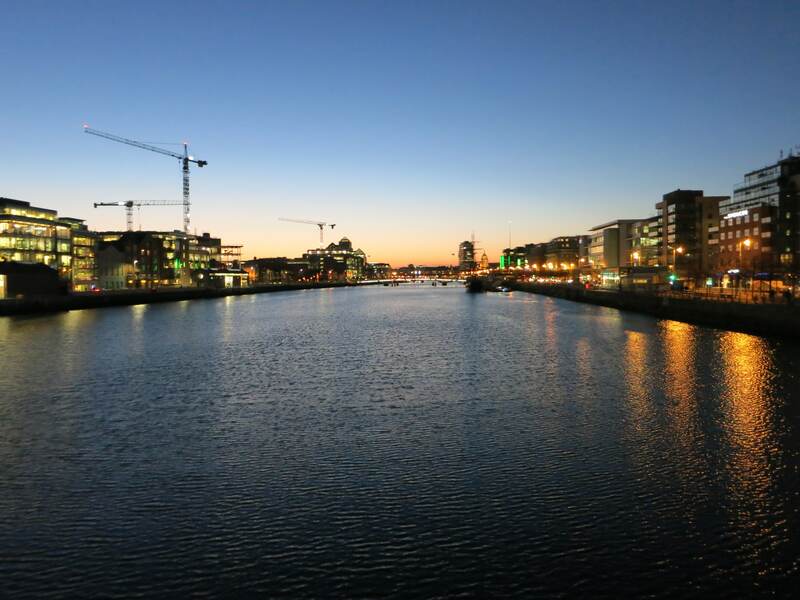 We chose to take a cab directly into Dublin but you have the option of taking the 747 bus into the city also that will take you to various points in main parts of Dublin and eventually to Heuston station, where you can transfer to a train. In Ireland as in many countries across the world, you drive on the left, which for many North American visitors is exciting. There are many roundabouts, which we are seeing creeping up on North American streets but we have a long way to go. Our family has made a decision that even made customs give us a “good luck” speech. We decided to not check any of our bags and carry two big backpacks (one for myself and one for my husband) while our child carried a small knapsack with a couple of coveted toys. With backpacks on our back and big, heavy Canadian winter coats, we are ready to explore Dublin! When traveling with children, it is a completely experience from traveling with a partner or solo. 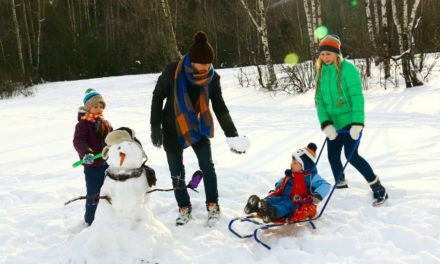 You go at a slower pace, you have to be ready for last minute bathroom breaks, and you have to do things that your children would want to do and prep them to get them excited about things that they would not naturally be excited about. I personally swear on the fact that taking your child to at least one playground a day can change your perspective on travel. I actually try to research a playground near our hotel so it can be our go to place so our little one can blow off some steam and maybe even make a quick friend or two. This has always worked and I highly recommend it. You also feel pretty special to just sit back, enjoy your child playing in a different country and it helps you regroup with your plans or just relax! I knew day one we should not have any high expectation with what we would be doing as my main goal is to adjust to jetlag and make sure our little one adjusts. We wanted to stay in a hotel where we were comfortable, we could spread out and we were in a central location on a quiet street. 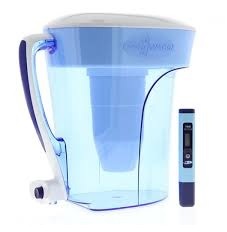 It sounds like a tall order but we found our perfect match with Staycity Aparthotels. Yes, get the hotel service with the space of an apartment. Our views were beautiful, our bed was comfortable, we can cook our own meals or bring back leftovers and have a fridge. We could also watch television in the living room at night without disturbing our child sleeping in a separate bedroom. On top of it all, there was a great nautical themed playground at St. Patrick’s cathedral about three blocks from the hotel. We were so pleased! We wrote all about the experience and we highly recommend you stay with Staycity! We decided we were well rested and wanted to go and explore Trinity College and see the Book of Kells. It was a dull day and we were not sure if it was going to rain (hey, we were not used to the rain at this point!) 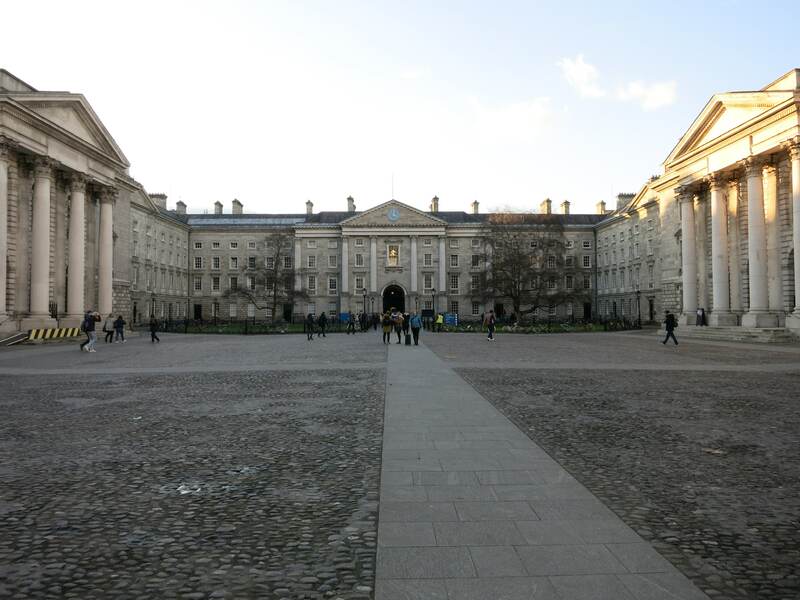 so we decided to make our way to beautiful Trinity College which is also the location of the book of Kells. 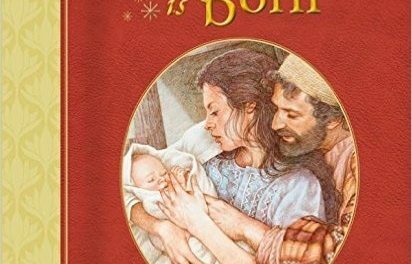 Your child will not feel like this is their average history lesson! The book of Kells is an illuminated manuscript Gospel book in Latin. It is so well preserved with vibrant colour of its time. 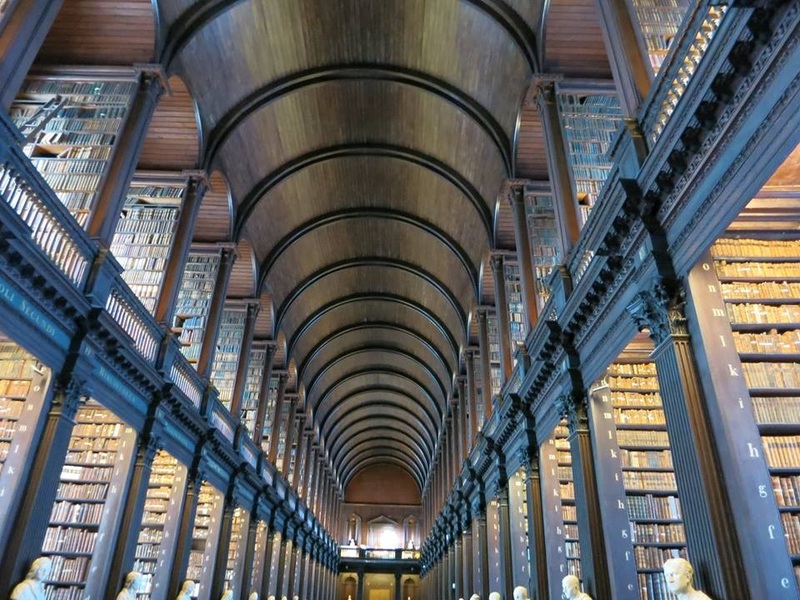 We bought tickets (family of two adults and two children is 28 Euro) which includes access to Trinity Old Library. This library is absolutely stunning! With sculptures of some of the world’s greatest writers and philosophers to the sea of endless books, this is a book worm’s paradise. Even if your children are not big readers, they will bask at the expansiveness of this building and be in awe of how magnificent it is. Our little one was kind enough to tip off security that she will be taking the Book of Kells home that night. No dear, Mom and Dad would not like their first day in Ireland to be their last, he he. 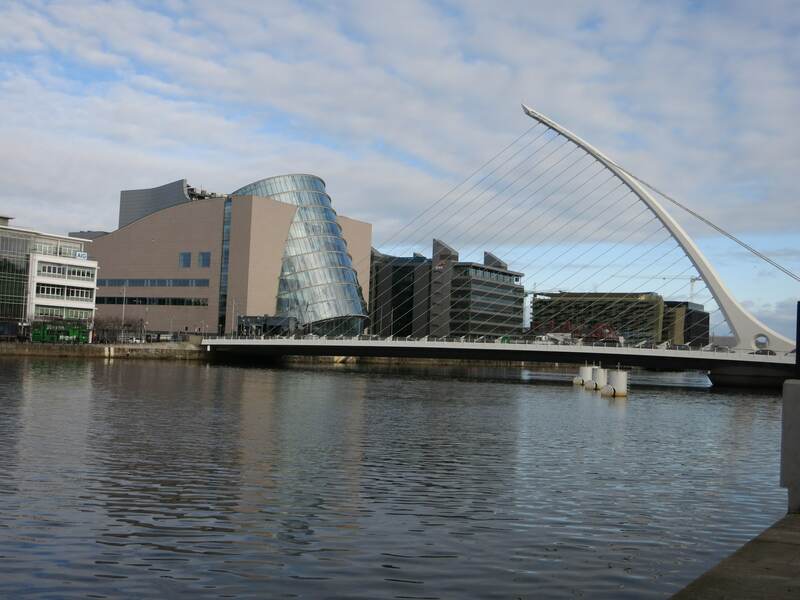 You and your children will love the art pieces, graffiti and murals of Dublin. The art scene seems to be getting bigger and bigger in Dublin and you are bound to find something new every street you turn. Make sure to take pictures of each piece you find and make a collage with the kids when you get along! Ireland is a great countries for foodies. The food scene is really growing with a fantastic growing vegetarian and vegan culture that is worth exploring. We decided to go to Kennedy’s for lunch. 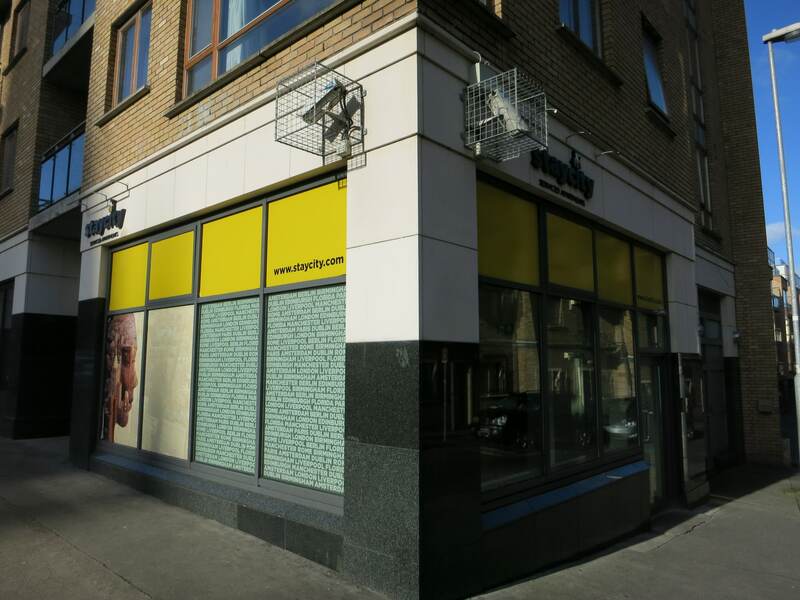 Established in 1850, Kennedy’s is less than a 10 minute walk from Trinity College and has an extensive history. I decided to go with a traditional fish and chips with mushy peas. My husband decided on the beef and Guinness pot pie. We had heard good things. The portions were big and our little one was able to have a full meal just from sampling from out plates. Y fish and chips were delicious as were my mushy peas. My husband’s beef and Guinness pot pie was the best! I did try (a lot) of it and I don’t think I can ever go back to pot pie without Guinness in it. This is a must have for the hungry tourist! You will be delighted at its delicious taste, generous portions and more. I am happy that my husband is a good sport and shared. Families should always stop in for lunch at Kennedys for great service and great food. 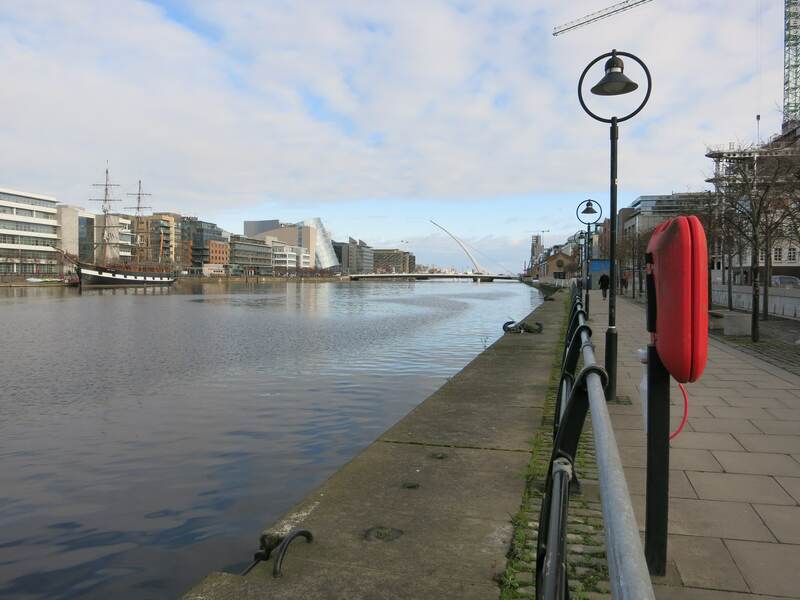 The River Liffey is a great guide around central Dublin and for those who are not good with directions, it is a good central point. Each bridge is completely different and beautiful, so that can help you know where you are based on the different bridge designs and the river. We walked up to the Liffey and came across the Famine Memorial in the Dublin Docklands. 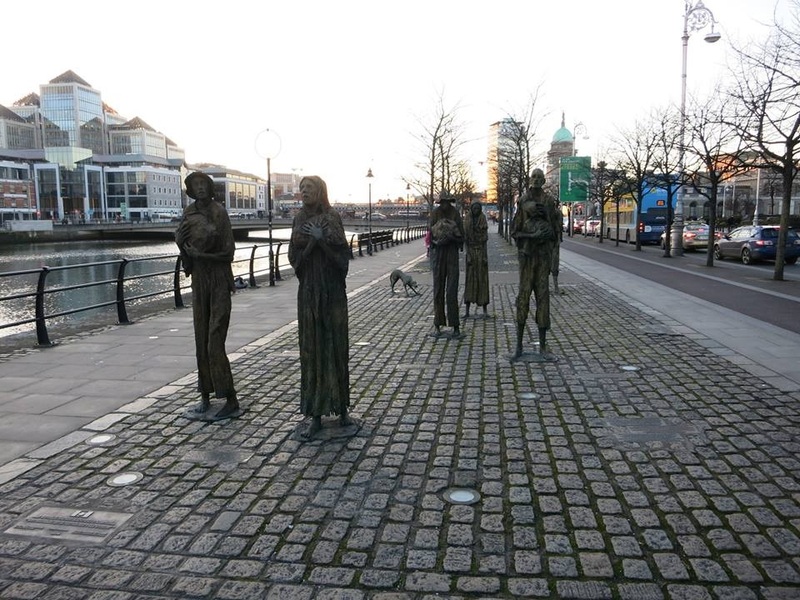 This commemorates the Great Famine of the mid-19th Century that killed approximately one million people and caused a million more to emigrate. 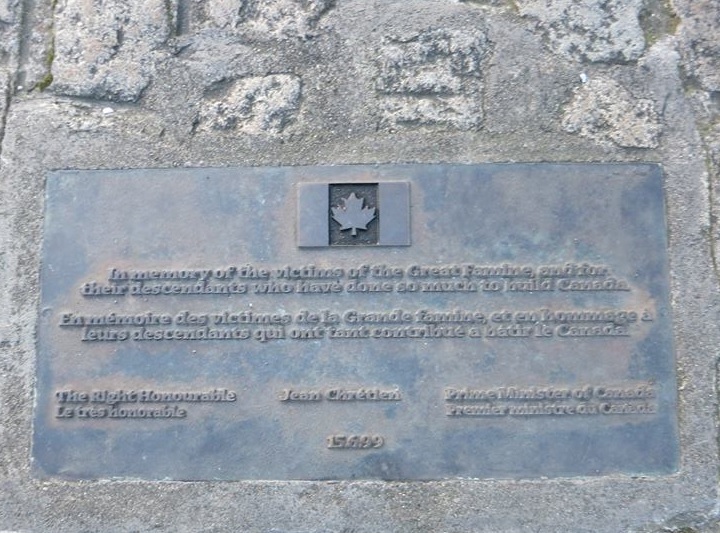 This is not only important to Irish history but to Canadian and American history as well. We will have a separate article on this, but touchingly, in Toronto, the same sculpture had erected the statues arriving in Toronto. It is so touching to have seen these statues both in Dublin and Toronto. If your family cherishes history or if you have Irish history, this is something you should see in both cities. It is moving and a part of world history. It was a humble reminder of the history of not only Dublin, but Ireland. We were humbled to remember that no matter what your nationality, we are all connected. A thoughtful time for our trip. 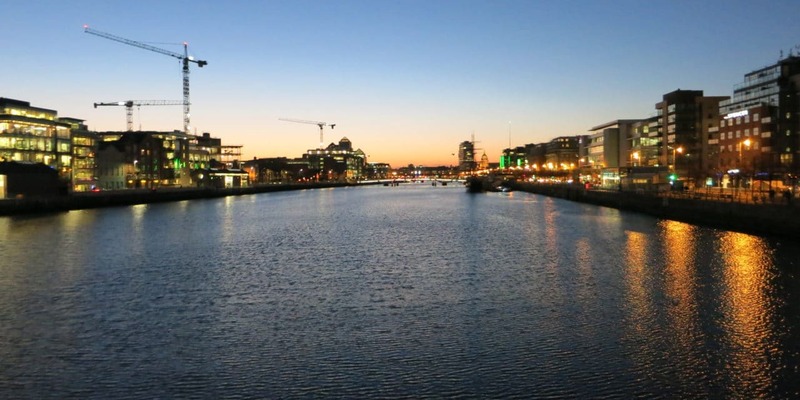 Night was coming but we all had jetlag and our little one wanted to move, so we decided to walk back to our hotel and continued to explore the bridges, including the Ha’ Penny Bridge which is Dublin’s oldest pedestrian crossing! After dinner, we decided to swing by O’Connor Street as there is never a dull moment! Use the Spire as your guide to reference that you have arrived! This is where a lot of your shopping is done and where a lot of younger people like to hang out, so you will find a lot of trendy restaurants, pubs and shops here. 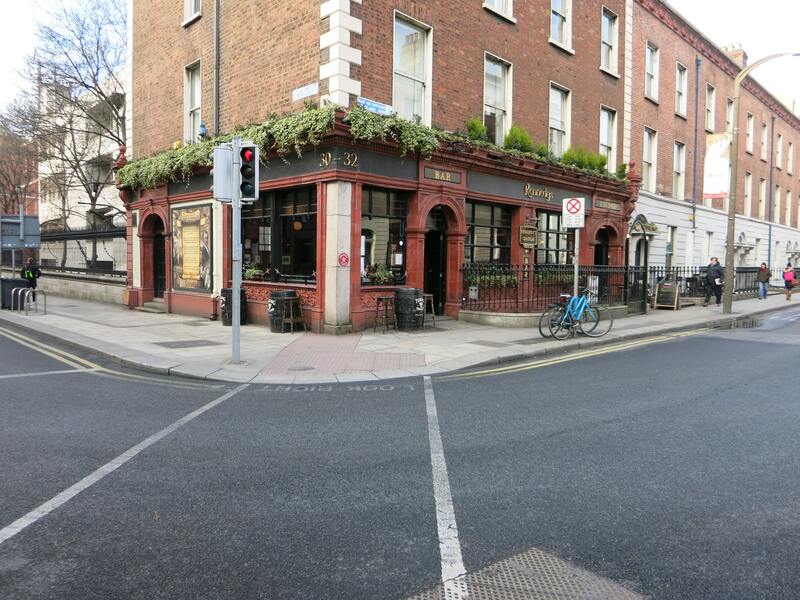 This is a perfect place to find a quick eat, be in the middle of the city and just feel Dublin’s heartbeat! 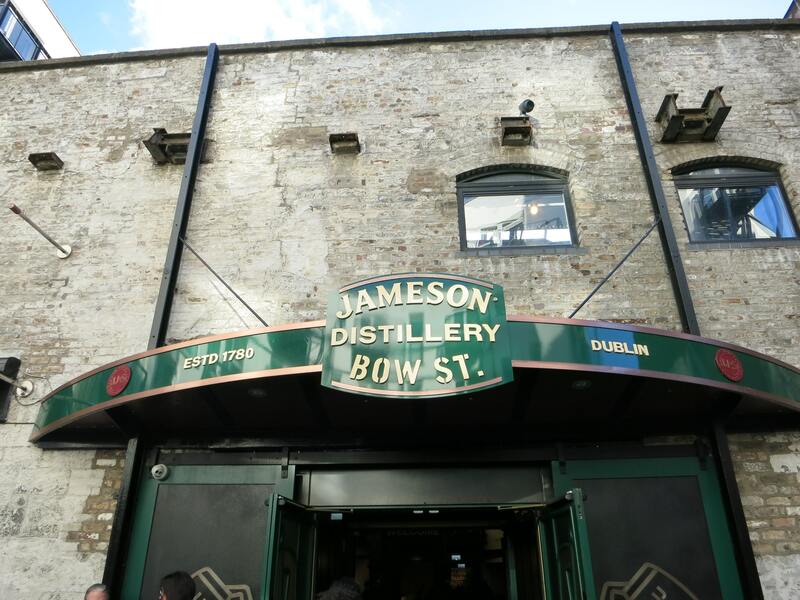 You can walk from O’Connor Street to the Jameson Brewery. You and your partner can take a tour and whiskey tasting at the birthplace of Irish whiskey. This is a beautiful place and a must try for Whiskey lovers. 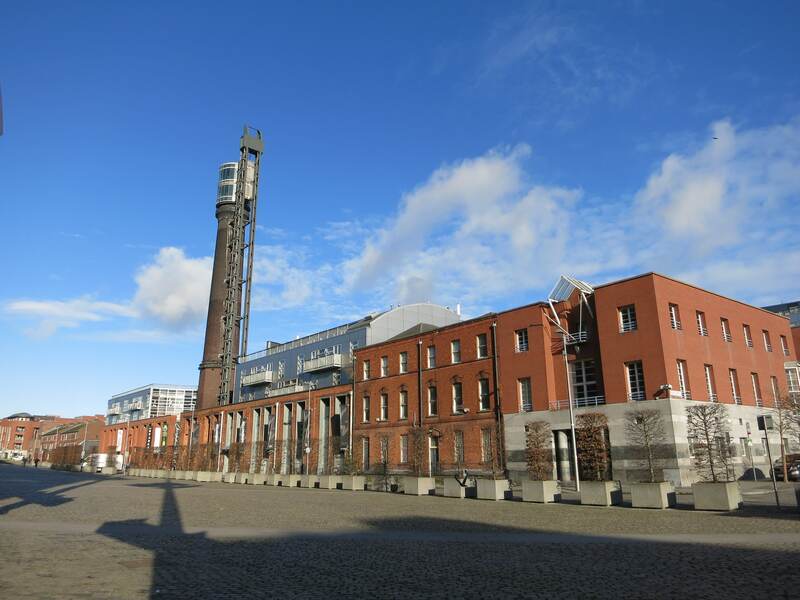 Take a tour of the brewery telling the beautiful tale of Ireland’s famous beer. There are tastings and a beautiful rooftop bar that is a must experience! 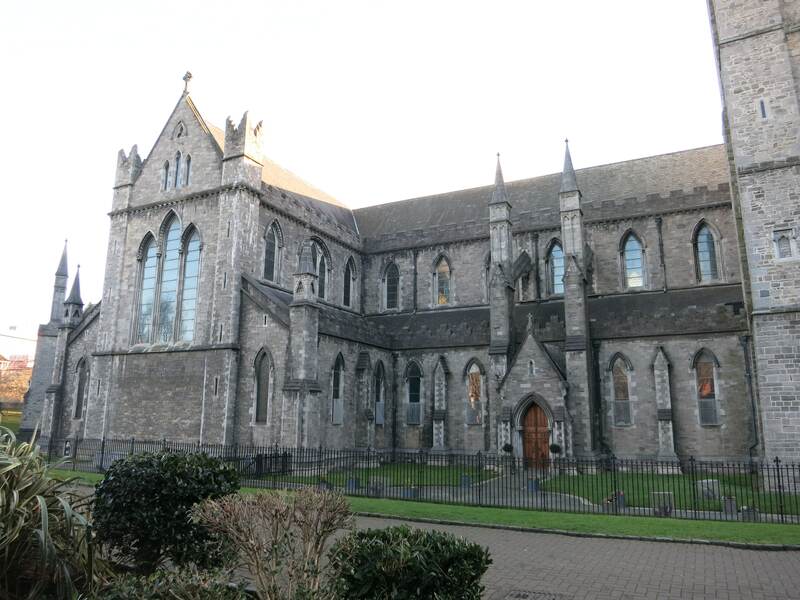 The beauty of Christ cathedral and St. Patrick’s Cathedral tells a lot of Dublin’s history. Whether you are a Christian or not, you will be amazed with the architecture and beauty that these churches show. St. Patrick’s is only a few short blocks from our recommended hotel, Stay City. Visiting Dublin would not be complete unless we visit our wonderful friend Mamma Fairy. If there was a perfect blogging Ambassador for Dublin, this is your girl. 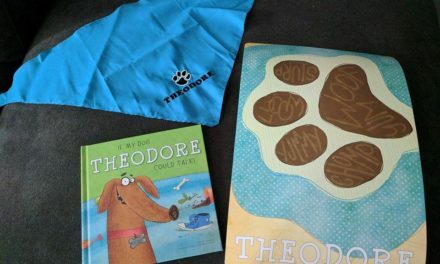 Her kindness and generosity (she brought our little one some wonderful books which included a great Gaelic book for beginners) helped us make Dublin a wonderful experience. Her blog is so much fun to read and if you’re not reading it, start reading it now! Laura made sure that we were well taken care of in Dublin and she should be everyone’s go to blog! If Dublin was looking for a blog ambassador, we nominate Laura! Making friends and going out to eat or sightseeing can make your families experience that much greater. You get the inside scoop of fabulous local places to eat and visit, you have the familiarity of a friend who is there to help you and watch out for you and you get to make new memories. Laura has become a good friend of The Baby Spot and a personal dear friend of mine. 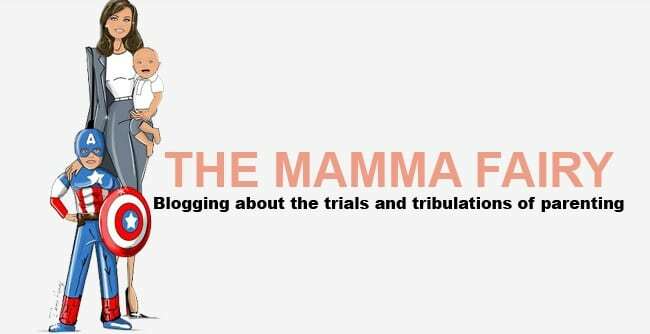 If you do not know someone in Dublin, visit blogs like the Mamma Fairy to get you acquainted with any city you travel to, so you still get the benefit of an inside scoop. Many bloggers will answer your personal email and give you even more tips, tricks and advice. Take the time to walk or take local transport with your family. Dublin is definitely a walking city and your children will crave the exercise. 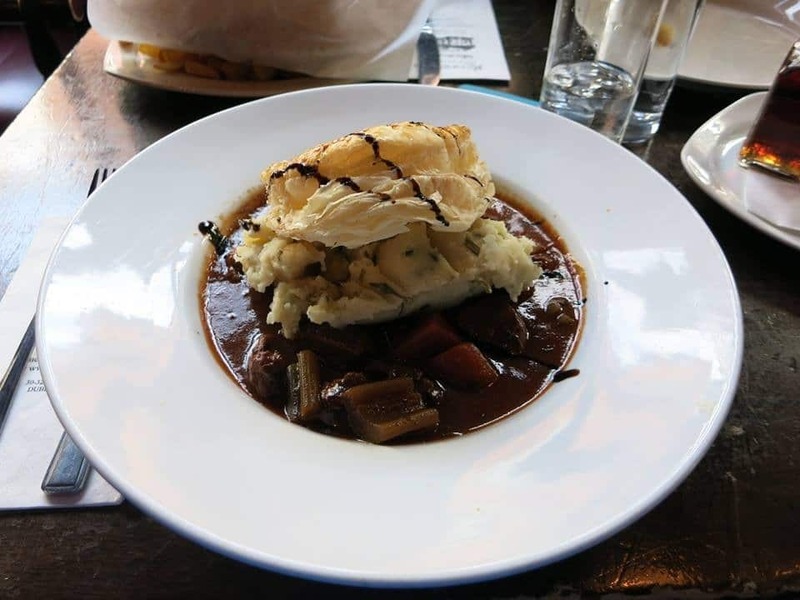 Dublin has endless amount of restaurants and pubs where you can eat, drink and enjoy your family. We went to the Brazen Head for lunch. It is Ireland’s oldest pub dating back to 1198. The Brazen Head is famous for its lengthy list of beers and burgers and fish ‘n chips. We were leaving Dublin to take Irish Rail to Cork and wanted to have a fun place to eat, so lunch at Brazen Head it is! If you are looking for a date night, this is the place to be. With live music every night, you are guaranteed to have a great time. You can also experience Irish Storytelling and get a taste of some Irish Folklore. Dublin was an amazing city to begin our touring of Ireland. We were so excited and met so many great people. Our little one got to meet so many wonderful people, who were interested in us and so keen to give us advice, tips and tell their story. With all of the fun and excitement, we almost missed our train. Thankfully concierge at Staycity made sure that we got a taxi and made it to the train station on time, with about 20 minutes to spare! I am a bit nervous carrying this big backpack across Ireland but so far, a quick taxi ride to the train station is not hard at all! Maybe backpacking isn’t so bad after all! Dublin was a fantastic city and a great introduction into Ireland. Now it is time to go on Irish Rail and enjoy our two hour trip to Cork! We will see Dublin again soon. It is definitely a place to visit again and again. You will never be bored with all of these fun things to do in Dublin with your family.